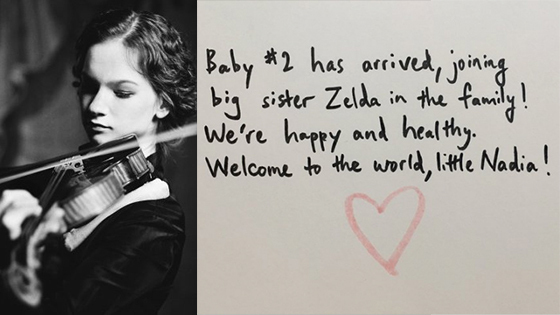 May 30, 2018, 11:25 AM · Congratulations to Hilary Hahn, who on Wednesday announced the birth of her second child, Nadia! On both her Twitter and her Facebook pages she posted a handwritten note that said, "Baby #2 has arrived, joining big sister Zelda in the family! We're happy and healthy. Welcome to the world, little Nadia!" All our best to Hilary and her family! May 30, 2018 at 06:43 PM · Congratulations, Ms. Hahn! May 31, 2018 at 02:21 PM · I know of no other violinist whose private life is followed with so much interest. May 31, 2018 at 07:59 PM · Well, she does do blog posts about her life and has for years. How many other violinists do that? June 1, 2018 at 03:14 PM · I think it's great that she interacts with fans through social media. It builds a younger following too --- many who can't afford to attend her concerts. Ray Chen, Philip Quint, and Anne-Sophie Mutter (!) are also pretty active on Instagram. Ray Chen did an Ask-Me-Anything (AMA) on Reddit a few years ago too. Pretty cool. June 2, 2018 at 06:44 PM · I think this is beautiful!! Currently off Facebook, (computer troubles), this is joyful news from a marvellous violinist and, I'm sure, Mother!! It depends on the individual, but some concert artists deliberately keep 'under the radar' to deflect trouble ~ Hilary Hahn is doing a great job of co-mingling her career and personal life 'High's'!!! Heartiest Congratulations to Ms.Hahn, her husband, daughter, Zelda, & 'little Nadia'!!! mentor to Aaron Copland, Samuel Barber, & Norman Della Joio, Mme Nadia Boulanger!!? ?